Bo and his son, Trent, along with good friend Paul Broddick, did a little fly fishing together last weekend and took a little time to work on fish photography. First be sure to get your hands wet and have the photographer prepared to take the photo as soon as the fish comes out of the water and return the fish to the water immediately. Have a good background and get the sun behind the camera. It is also a good idea to remove your sunglasses. The two photos above are of the very same Rainbow Trout that Trent caught on a #14 RG/PT Cruiser. 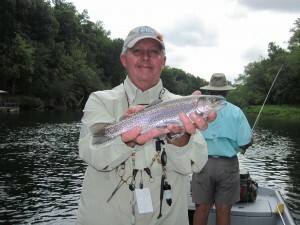 This certainly demonstrates that how you hold a fish makes a huge difference in your photo. Hold the fish in your fingers with your palms extended outward and show the sides of the fish to the camera while trying not to expose the belly of the fish which is very light in color and will create a glare on your photo. 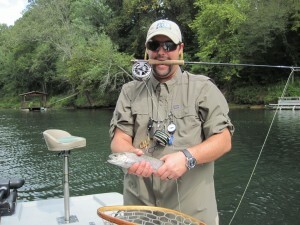 Extending your arms and the fish toward the camera will help create a much better photograph of your fish. Finally it is also a good idea to kneel down in the water to display your fish for the picture or have another angler hold a net under the fish just in case the fish slips out of your hand. Bo really likes just photographing a fish while still in the net and in the water. We have had some wonderful fly fishing on all of our rivers lately and with the fall season coming the fly fishing is only going to get better. We hope you will book a trip with us at Empty Creel Fly Fishing Guides and Outfitter and let us take some great photos of your fly fishing trip.